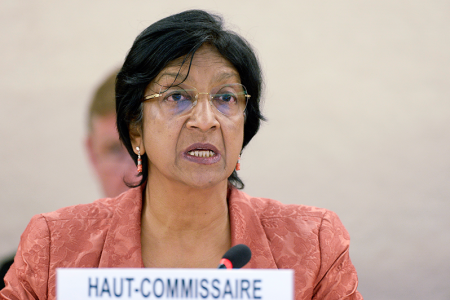 GENEVA (26 June 2014) – UN High Commissioner for Human Rights Navi Pillay expressed concern Thursday about the large number of executions in Iran since the beginning of this year, calling on the authorities to halt, in particular, the imminent execution of a juvenile offender. “The imminent execution of Razieh Ebrahimi has once again brought into stark focus the unacceptable use of the death penalty against juvenile offenders in Iran,” Pillay said. Ebrahimi was convicted of killing her husband when she was 17 years old. She was married to him at the age of 14, gave birth to a child when she was 15, and says she was subjected to domestic violence. “I urge the Iranian authorities to halt the execution of Razieh and all other juvenile offenders,” Pillay said. Another juvenile offender, 17-year-old Jannat Mir, an Afghan boy, was hanged in April in Isfahan prison, in central Iran, for drug-related offences. He reportedly had no access to a lawyer or consular services, raising concerns about whether fair trial standards were observed in his case and those of five other Afghans executed along with him for similar offences. Pillay expressed alarm at the large number of juvenile offenders who reportedly remain on death row in Iran. According to information gathered by the UN Human Rights Office from reliable sources, some 160 people are reportedly on death row for crimes they committed when they were under the age of 18. The High Commissioner also condemned the execution of a number of political prisoners – at least six since the beginning of this year. Four others — Hamed Ahmadi, Kamal Malaee, Jahangir Dehghani and Jamshed Dehghani — all members of the Kurdish community, are at imminent risk of execution. They were convicted in 2010 on charges of Moharebeh (enmity against God) and Mofsid fil Arz, (corruption on earth) after trials that fell short of the international fair trial standards. More than 250 people are believed to have been executed in Iran so far this year, with some sources suggesting a considerably higher figure. Most of the executions were carried out for drug-related offences, which do not meet the threshold of “most serious crimes” for which the death penalty may be applied in international law. At least 500 people are known to have been executed in 2013, including 57 in public. Pillay urged Iran to immediately impose a moratorium on all executions, with a view to abolishing the death penalty.